Reports to the Company Lieutenant or Captain. Sounds calls on company level. Will listen for calls from brigade or regimental level and interprets the call for the company commander. Must know the Skirmish Calls. Is responsible for orderly, guard and fatigue duty. Messes with company. Rank of private or corporal. Reports to the general, colonel or adjutant of the Regiment. Accompanies the commander on the field, sounds calls on the brigade level and relays those calls to regimental level. Administrative position. Must know the Skirmish Calls, know how to form the brigade by the bugle. Is responsible for the training and deportment of all buglers in the brigade. When no drum major available must lead the massed musicians in dress parades or lead bugle corps. Messes with regimental staff. 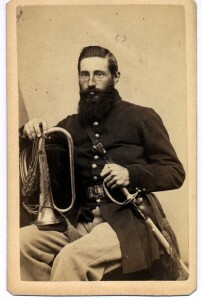 Rank of Chief Bugler or Principal Musician. A Bugler will always be at Headquarters of each regimental commander. The Adjutant will detail buglers to attend at headquarters from whence all calls will be sounded. There are no times assigned to these calls as they could happen any time at the discretion of the commander/adjutant. Officers and NCOs must know their respective Prelude Call to avoid confusion. Prelude calls are signals that particular to a unit to identify calls following the prelude. All calls are echoed by subordinate buglers and played by the Field Musics. 5. To the Color to form the regiments which then march to the place designated for the brigade to form. On the command of the brigade commander, The Forward is sounded to begin the march. If there are fife and drums, they will strike up a cadence and “The Girl I Left Behind Me” and other martial tunes for a short distance after which the order will be given for the Route Step. The bugler sounds Attention at which the fife and drums will begin the cadence, troops fall into into step bringing muskets to Shoulder Arms. Captains move up to the head of their companies. The bugler then sounds or echoes the command Halt. If the troops are to stack arms for an extended rest, the bugler will sound Fix Bayonets and the Disperse (or Lie Down) on the command of their respective regimental commander. The bugler will sound The Recall, Attention and The Assembly to form the troops. They will gather their arms and the bugler will sound Unfix Bayonets. To resume marching the bugler will, on the command of the brigade commander, sound The Forward. As always, the calls are echoed by regimental buglers.